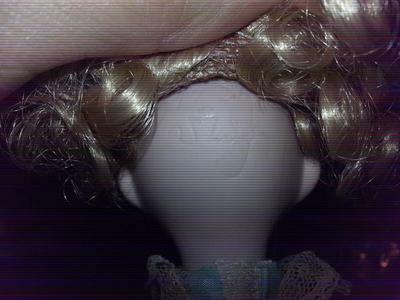 I can't identify the doll I recently bought. 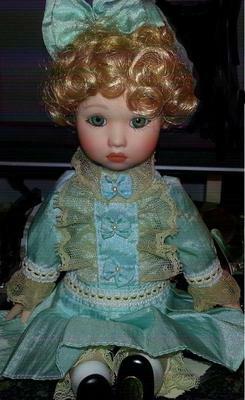 Well while waiting for takeout, I stepped out into the mini-mall and saw that they had a thrift shop so I went in and I saw what I think is the cutest doll I've ever seen. I don't expect her to be a million dollar find, but I always like to know the history behind things like this or at least whom she was made by. What I know is she was made in china. I believe she has a Bisque face, hands, and feet. Her body is cloth here dress is blue and cream? or it could be white that has turned. She has markings but I can't make them out and she has a number(3226). Standing she is about 9.5-10 inches tall. Her Clothes are a silky material somewhat like the feel of a non-plastic umbrella. Any help would be loved and thank you. If more info is needed please feel free ask.